Russo and Steele's 15th Annual Scottsdale Arizona. The year 1957 was considered the top year for all General Motors styling whether it is Buick, Oldsmobile or Cadillac and it certainly holds true for the 1957 Chevy. Being a winner at a national Chevy show is always about one-upmanship, nothing can have more pride of ownership than a Dual Quad ’57 Chevy convertible that is fully, and correctly date coded. If you collect only the best, you may just want to have this car in your collection. 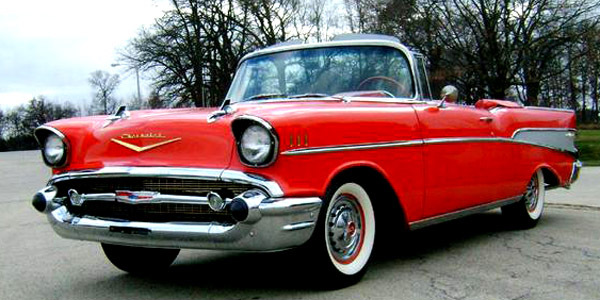 This 1957 Chevrolet Bel Air 4X2 Convertible represents the most iconic American car of the 1950’s. The most desirable body style of course is the convertible; the most desirable convertible would be a V-8, automatic with power steering, power brakes and power top. To take the car to the outer limits it would need to have the Dual-Quad carburetor setup, which this car has. The engine has date coded correct Dual Quad carburetor engine and everything on it is date coded correct.